Summary: Satoshi Kon's directorial debut went perfectly. It quickly establishes his style of storytelling and cinematography, which is closer to live-action films (in particular, Alfred Hitchcock) than anything else in anime. It is not a mere copy though, as Perfect Blue proves; animation is used to it's fullest to confuse and intrigue the viewers. Perfect Blue is a murder mystery full of twists and turns that many would not expect. When you start to figure something out, a plot twist is revealed and you are required to question your previous assumption. In the end, one of the later plot twists makes you lose all hope of piecing together a half-decent understanding of the plot as everything that has happened up to that point is put into question. However, Satoshi Kon weaves this tale so well, that you feel compelled to try and catch up. Many viewers might be reminded of Afred Hitchcock's films when viewing Perfect Blue, but one thing that sets it apart is the animation medium. The beauty of animation is that we are allowed to suspend disbelief as we watch a tale unfurl on-screen. Characters are not real life actors, people are not physically moving around and acting things out. We know it is fantasy, but at the same time we are drawn into Kon's world as if it were real. When Nemo starts talking in Finding Nemo, we're fine with that, because that's the "reality" presented to us. However, if Mima's fish starts talking, we would freak out! What Kon does here is that he manipulates the viewer, establishing that what we are seeing on-screen, though fictional, is grounded in common sensibilities. As we grow more comfortable with his vision of the on-screen world, Kon throws us a curve ball and gives things a psychological twist. Animation works much better in this respect compared to live-action as it can freely bend and twist the rules without looking too ridiculous. They do not resort to cheap cheesy effects, swirly screens or distorted faces. Instead, it deals with disturbingly real imagery and slightly twisted logic that a psychologically sick patient might encounter. It is this blend of fantasy and reality that leaves viewers at the edge of their seats every minute of the second half. Most audiences would struggle to follow the plot, but I guess that's the point of it all. Without giving too much of the ending away, well, it was expected and yet unexpected. A mishmash of plots that is supposed to confuse the audience as much as it confused the police and Mima in the film. This is perhaps the only weak point of the film. The run-up to the ending is quite frantic and too confusing. The conclusion could have been a little longer to let certain revelations sink in and delve into the mind of Mima post-revelation. Mitsuo Iso is listed as one of the Key Animators in this project, and it's quite easy to spot some of his scenes (the infamous stabbing scene pictured in this review). He probably drew everything in those scenes himself in key frames, without any in-betweeners. The rest of the animation key I'm not too familiar with, but I'm sure a lot of them are superstar animators (given this is a Madhouse production). For example, the vaguely familiar Shinji Hashimoto turns out to be a Key Animator in Wanwa (Ohira Shinya's work), Akira, a bunch of Studio Ghibli works, and a bunch of Satoshi Kon's works. 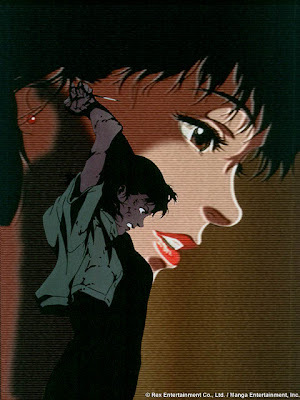 Satoshi Kon started out as a director with Perfect Blue in 1998. The confidence with which he directs and tells this story shows that he is a dedicated master of his craft. Sorry, I loved the review and all, but have you seen how great you use of English is? Wow. Just wow. Thanks. @Alexis Thanks for your comment! And thanks for the link to the review! Much better written than mine. I'm just incapable of writing summaries! @NyNy Thanks for reading! I realise my review hardly talked about the content of the film. The best way to find the answers you are seeking is to re-watch the film, keep the ending in mind, and focus on Mima's state of mind.